Two attractions, to stretch the term, command the itinerary of every foreigner who visits Cambodia: Angkor Wat and the Killing Fields. And for good reason. Angkor Wat is awesome in the word’s true sense, a massive, sprawling temple complex that was the heart of both the pre-industrial world’s biggest city and the Khmer Empire, which dominated South-East Asia for seven centuries. And in the last century’s charnel house of horrors, the genocide perpetrated by the Khmer Rouge is rivalled only by those committed against Europe’s Jews, the Ottoman Empire’s Armenians and Rwanda’s Tutsis. 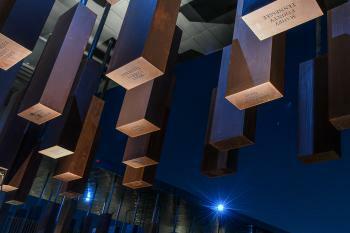 It would seem odd to come to the country without marvelling at the former and paying tribute to victims of the latter. But Cambodia is more than simply history and blood. It is a vibrant, developing country, not a cause or a mausoleum. Its government may be repressive and corrupt, but its populace is young, optimistic and forward-looking. Visitors who venture beyond the top two – or as far beyond as possible, when Angkor Wat is emblazoned on the country’s flag and the Khmer Rouge’s long shadow still looms – will be richly rewarded. During my three years as The Economist’s South-East Asia bureau chief, I got a taste for the country without having had the opportunity to enjoy it at leisure; so, as my family and I prepared to move back to America, we took some time out to discover the country’s southern coast. We based ourselves in Kep, a beach town on the Gulf of Thailand, less than 30km from the border with Vietnam, a three-hour drive or – on weekends – a train trip from Phnom Penh. We drove, meaning we hired a driver; if you visit Cambodia, under no circumstances should you do your own driving. What look like two-lane highways somehow have five lanes: one in each direction for cars, buses and lorries, one each for motorbikes and farm vehicles, and one in the centre for passing, used by everyone, all the time, in a perpetual game of chicken. We stayed at a modest, beachfront hotel run by a Cambodian and an Australian, and discovered on our first stroll that Kep is, literally, a sleepy town; just up the road, there was a small commercial square that ranged around a traffic island that was covered in shaded wooden platforms, where you could rent hammocks and nap away the afternoon. When hunger struck you could order a plate of sparkling-fresh seafood and rice from one of several apparently identical open-air restaurants. Cambodians on holiday throng Kep’s beach. In the early morning women in conical hats lay woven carpets on the pavement adjacent to the beach; families can rent the space for $10 per day. The partying starts early. I took my sons for a mid-morning walk along the shore, and we were hailed by a group of men surrounded by an impressive mound of empty beer cans (Cambodia has three main beer brands: Angkor, Anchor – pronounced an-chorr – and Cambodia. They are indistinguishable but pleasant light lagers). The water was warm and quite calm, though it was also murky and had a slight – but troubling – viscosity. One of my sons said it made him itchy and I understood why Cambodians, particularly Cambodian women, prefer to bathe fully clothed. We found clean water on Rabbit Island, a 20-minute boat trip away. On the ride my sons were entranced by schools of silver anchovies that leapt from the water in unison, tiny mercury commas punctuating the sky. 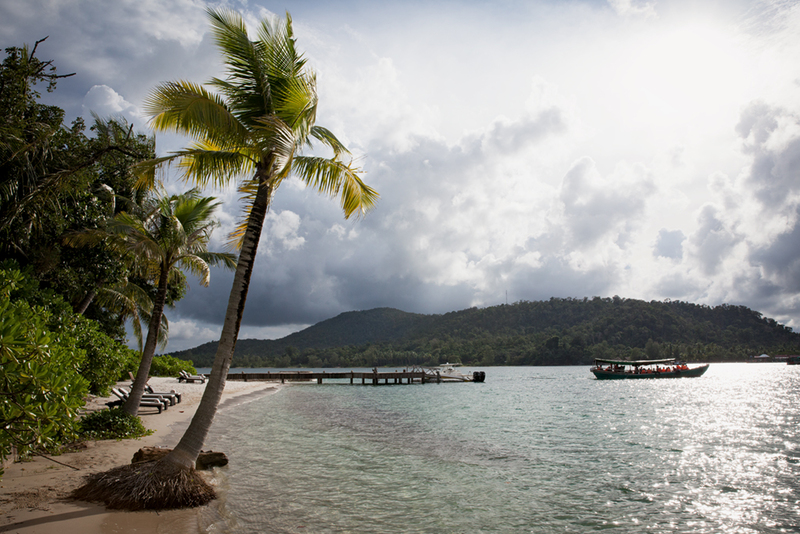 The island itself was perfect for doing nothing at all – the sort of place where the day’s highlight is finishing a few chapters of a novel or snorkelling out to watch hermit crabs settling into the sand beneath a coral reef. The boat cut its engine about 20 metres from the shore. We waded onto the island and a local showed us to a shaded platform, with the understanding that when hunger or thirst struck we would patronise her restaurant. A row of bungalows housed overnight visitors for about the price of a decent sandwich in London. 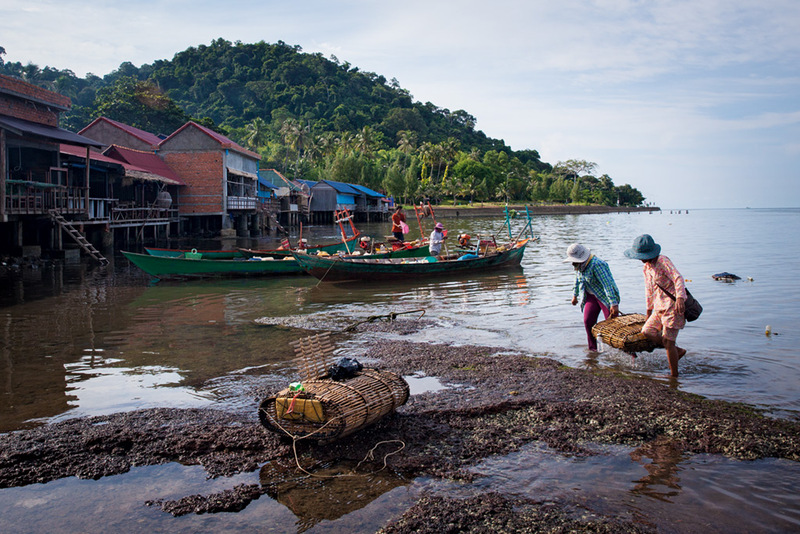 Among Cambodians, Kep is famous for its food – particularly its crab. 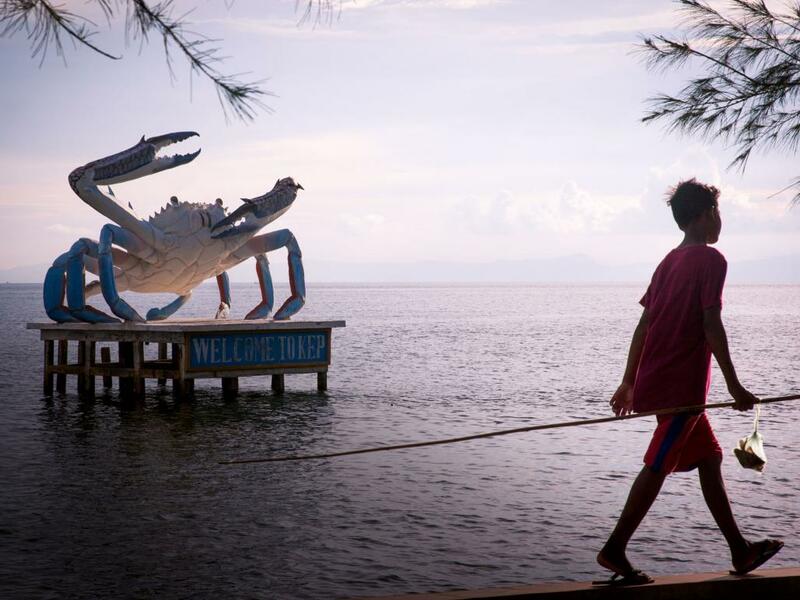 As you round the highway into town, a statue of a giant blue crab rising from the water greets you. Its claws are raised as if for battle and the sign in front of it reads, “Welcome to Kep”. Thousands of its kin are devoured daily, either at the town’s crab market or at one of the surrounding restaurants. They are at their best simply grilled or boiled, though some find the work of cracking the shells and picking out the meat tedious. They do not quite reach the silkily delicious level of blue crabs from America’s east coast, but Cambodia’s beaches are far more pleasant than Baltimore’s. At night hundreds of blinking green lights dot the horizon – these are squid boats, tiny craft that hunt cephalopods in the dark and return to sell them at daybreak. Closer to shore, Cambodian men (as far as I could tell it was only men) hunt squid using a method I’ve always known as “gigging”: searching for squid with a torch in one hand and impaling them with the improvised trident in the other. The local squid are delicious by whatever method they reach your plate, fat and sweet, particularly when cooked with the local peppercorns. 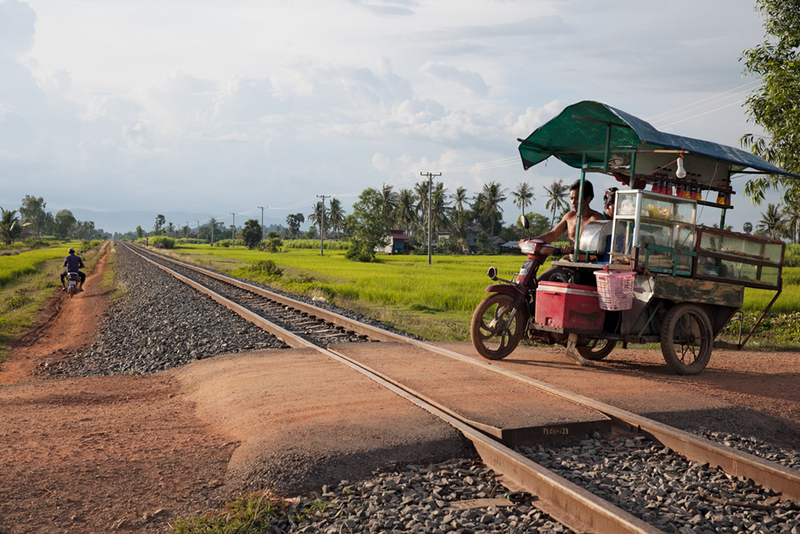 These come from Kampot, an hour’s charming tuk-tuk drive west of Kep. Pepper was grown here for centuries, but when the Khmer Rouge came to power they uprooted the vines in favour of simple, proletarian rice. The vines at a farm we visited had been producing for four years, and Kampot pepper, as everyone in the province is keen to tell you, is the first Cambodian product to have been given a Protected Geographical Indication seal by the European Union. The black pepper really is delicious: bracingly hot but floral, with hints of eucalyptus and lemon, and a long finish. I was surprised by how rarely black pepper showed up in the region’s food; instead, chefs prefer clusters of fresh green peppercorns, which crunch and then explode in the mouth like hard caviar. We ate lunch on a shaded, hammocked platform near a durian plantation, on the banks of what our driver called “Secret Lake”, a calm lake surrounded by gently rolling hills. Lunch consisted of a mound of rice and a whole roast chicken impaled with a carving knife. The presentation may have been rustic but the bird itself was lean, gamy and delicious: it had clearly been an active beast that had never seen a growth hormone. On the way home we stopped at a salt field, a landscape of shallow, squarish pools bisected by mud footpaths and dotted with warehouses full of still-wet, large-crystal salt raked from the evaporating water. Our driver walked into one of the warehouses to fill a couple of plastic shopping bags with loose salt, and seemed puzzled that we weren’t doing the same. After Kep my family returned home (school beckoned) and I continued on to Koh Rong Samloem, one of two small islands a 90-minute boat ride from Sihanoukville. It was an upscale version of Rabbit Island. Cambodia’s beaches have not yet been Club Medded to death, but proprietors have figured out the get-away-from-it-all aesthetic: the beachfront resorts all featured little bungalows set around a central dining area. At risk of sounding like a travel brochure, the water really was bathwater-warm and an arresting shade of Crest-toothpaste green; the sand really was white and fine as ash; and the intrepid young backpackers clustering around the “Dream Dorm” were so lithe and lissom that your middle-aged correspondent felt and looked like a hairy tub of yoghurt by comparison. I was tempted by the prospects of good snorkelling, and even more by a hike through the island’s jungle – but here, too, the seductions of reading and staring at the surf won out. Like Rabbit Island, Koh Rong Samloem has only generators for power and blessedly spotty Wi-Fi and mobile reception. It also has a general store that knows its captive audience: a small bottle of sunscreen was on sale for $15 (Cambodia uses American dollars in parallel with the riel), while a larger bottle of aloe sunburn ointment went for even more. After a day of splendid isolation, I stayed the night in delightfully sleazy Sihanoukville, where you can choose between sleeping in cheap hotels near crowded beaches and an array of bars and restaurants downtown, or more expensive but isolated resorts. I went for the latter. My resort was designed in a style I had seen in Ukraine, Myanmar and Russia: dictator-state grandeur, meaning senselessly sprawling, with huge gaudy buildings, overpriced food and, of course, a casino. I did not try my luck. By then it was time to head home; a good beach holiday lasts either less than a week or more than ten years. One of the perils of covering the developing world is you always feel as though you’ve arrived too late – “you should have seen this place 20 years ago, mate, it was paradise.” Cambodia’s beaches will inevitably attract more hotels, more crowds, more development, and then I’ll be the one babbling on about the good old days. So can you. Get there soon. •Try to visit Cambodia during the cool season that runs from November through March, though December and January can be crowded. April is scorchingly hot, and with the summer monsoon comes not just rain, but also flooding and damaged roads. 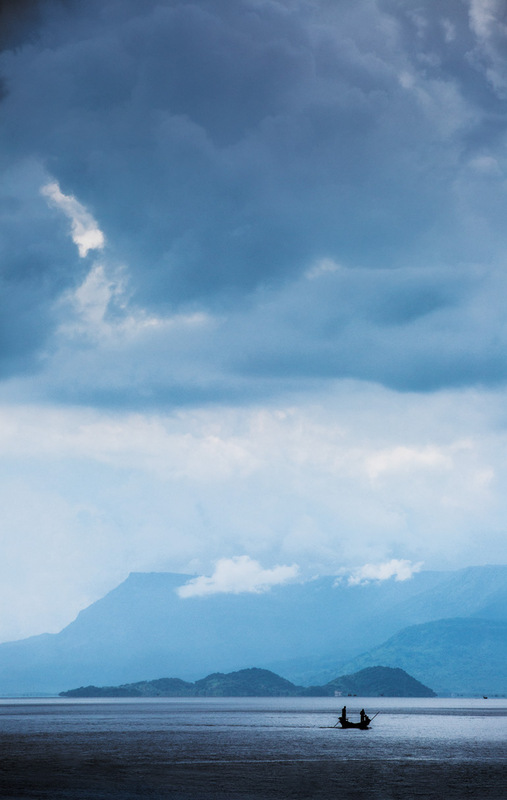 •Families should base themselves in serene, unhurried Kep. 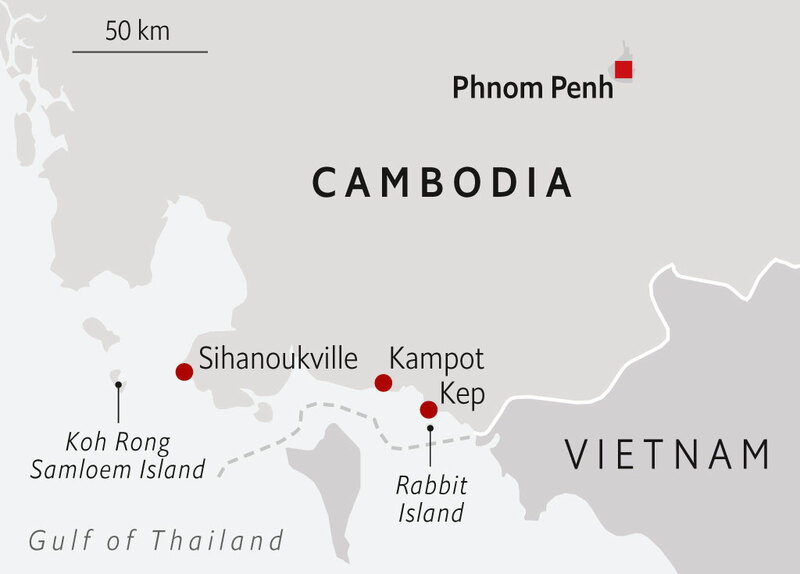 Kampot is pleasant but farther from Rabbit Island, which you reach with little bumboats that leave from Kep’s harbour. If you seriously want to unwind rent a bungalow on Rabbit Island and stay for a night or three. •Song Saa is a private island resort. It is not cheap, but for comfort and spa treatments, worth the splurge. •The Moonlight Resort on Koh Rong Samloem is chic yet affordable, a sanctuary from the backpacker’s huts. Arrange transport from Sihanoukville. Pack as light as possible: you’ll end up hauling your suitcase through surf and wet sand. 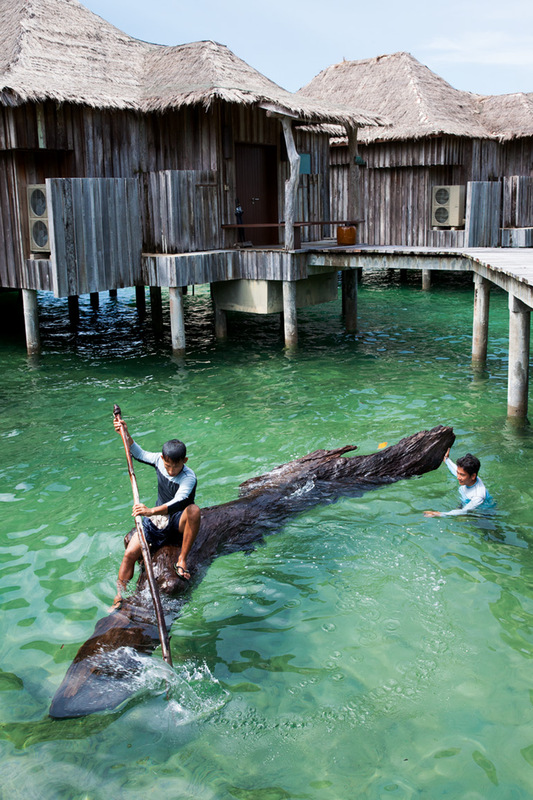 •Cambodia’s waterfront cuisine is solid but rarely extraordinary. Kimly, on Kep’s waterfront, does wonderful things with crab. Call ahead to reserve yours or risk disappointment.